“My Porcelain God”/“My Screw Up” / "“My Porcelain God”/“My Screw Up” "
After watching “My Catalyst,” I wrote in my notes that it was strange to see Elliot so marginalized from the arrival of Michael J. Fox as Kevin Casey. It was only after then watching “My Porcelain God” that I remembered this this episode was its inverse: While J.D., Turk, and Cox drift off into their own storylines, it leaves Casey in a position to help Elliot with her sudden intubation problem. It’s a case where, rather than Casey’s story arc with J.D. 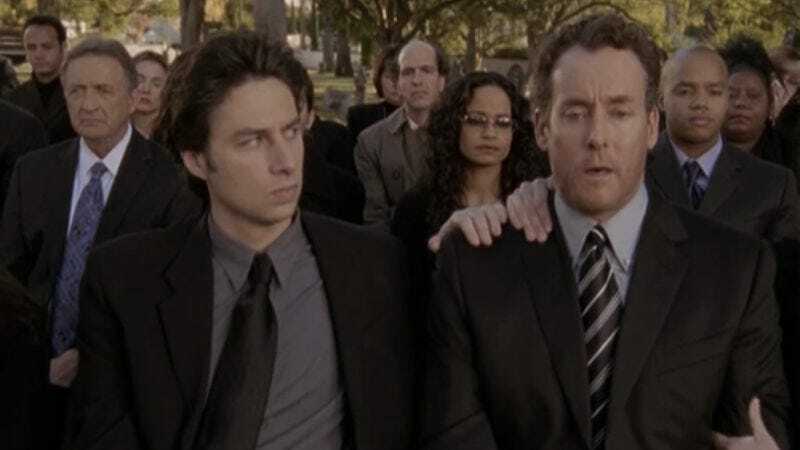 or another character extending over two episodes, Scrubs pulls back to consider how this type of character—both inspirational and a little odd—can impact the lives of most if not all of its characters. It also turns it into a little joke of sorts, making Elliot self-aware that she is seemingly the only person in the hospital that Casey hasn’t advised in some way (with the list of his advisees including both Snoop Dogg Intern and Dr. Mickhead). As the episode forces them together, though, it would have been too predictable and too problematic for Casey to just suddenly solve her problem. Elliot has been placed in this type of inferior position enough times that it risks damaging her credibility if she always needs to be rescued, and for Casey to magically fix her would do little for her character. Instead, the episode nicely connects the dots on how the two characters are similar—which, although defecation is used as the central point of connection, stems from varying levels of obsessive compulsive disorder—and uses it to provide some nice casual conversation, building Elliot’s confidence enough for her to follow Casey’s path up to the roof toilet. It’s there where she comes to an epiphany that—although involving a fantasy version of Casey who helicopters a patient onto the roof to push Elliot to face her fear of intubation and then makes out with her—is about her ability to power through the barriers she places in front of herself. It’s a nice beat for the character, and helps justify her exclusion the first time around. The rest of the episode technically involves a story about J.D. being Turk’s best man and Cox running into conflict with Dr. Kelso over the closure of a wing of the hospital, but “My Porcelain God” will forever be the roof toilet episode. What I love about the roof toilet is that it’s completely ridiculous but also incredibly useful as a storytelling device. Its involvement in Casey and Elliot’s storyline is where it’s most strongly integrated, connecting to their respective fears of public toilets and enabling the episode-ending fantasy with the helicopter, but it’s also a nice way to transition from one stage of a story to the next. For Cox, it’s where he decides to stick Kelso’s gardener Hector into Kelso’s office when there’s no rooms available due to the wing closure; for J.D., it’s the place where he realizes that all he needs to do is talk to Turk, which isn’t exactly a revelation on the same level but pushes him away from passive aggressive sabotage toward a real conversation. Neither storyline reaches the same kind of epic conclusion as Elliot’s, but neither does Elliot’s if we ignore the fantasy. The roof toilet—or, as the Janitor refers to it, his epiphany toilet—actually ends up creating fairly grounded situations if we consider their endings. Kelso reopens the wing of the hospital and reveals himself to be a better boss to Hector than he is to most of his employees at the hospital, but that’s consistent with what we’ve seen of the character in the past. Similarly, J.D. and Turk have their petty squabbles over Turk asking his brother to be his best man before J.D., but it boils down to a lovely scene where the two say some very meaningful and sentimental things while talking over one another, like men do. Despite there being something inherently wacky about a mythical roof toilet, the episode—perhaps mirroring future episodes that will mix fantasy with reality—is fairly basic in its characterization, a nice sendoff for Michael J. Fox—who I’ll be happy to see return to TV this fall—and a memorable outing in its own right. It’s difficult to revisit “My Screw Up” a decade later. It’s a brilliant and heartbreaking episode, one that tells a story about grief and loss without fully revealing the magnitude of that loss until the very end. As Dr. Cox struggles in the days following the death of a patient, blaming J.D. and himself, it seems out of proportion with the fairly random patient the episode allows us to believe passed away: when it’s finally revealed that it was in fact Brendan Fraser’s Ben who suddenly died, and that Dr. Cox has spent the episode working through his grief by talking with Ben’s ghost, it transforms the episode into one of Scrubs’ most memorable. It’s also what makes it so difficult to return to the episode. If we treat “My Screw Up” like a puzzle—Bill Lawrence has spoken of it as an homage to The Sixth Sense—rewatching the episode is like the difference between allowing the puzzle’s final image to reveal itself gradually and having the final image immortalized in your mind before you even start. As much as this is logical, and as much as the ending has become the episode’s legacy, it makes it difficult to step back into the shoes of watching it for the first time, of experiencing the reveal and its construction without knowing the inevitable outcome. I unfortunately have no memory of when I watched this episode for the first time, either because my early viewing of Scrubs was too scattered—I don’t remember when I first started watching live—or because the weight of its ending has simply erased that initial experience. The initial experience is more vivid for Neil Goldman. Along with his writing partner Garrett Donovan, Goldman co-wrote “My Screw Up,” which would turn out to be Scrubs’ only Emmy nomination in the Comedy Writing category over the course of its run. These TV Club Classic reviews always balance a combination of hindsight and time travel, and in an effort to achieve the latter I asked Goldman if he had any memories from writing the episode. “I can tell you we were nervous about people ‘getting’ the reveal,” Goldman suggests. It turns out that the wife of one of NBC’s executives at the time had been entirely confused by the episode, raising some questions about whether the episode was as clear as it needed to be. According to Goldman, they “shot some footage of John McGinley looking through the photographs that Ben took while sitting at the funeral, but Bill, Garrett and I ultimately decided it played too maudlin and we were better off erring on the subtler side.” It’s a decision that allowed McGinley’s performance in the episode’s final scene to sell the weight of the moment all on its own—that final shot of Perry, tears streaming down his face and J.D. and Jordan consoling him, tells us more than any set of photographs would. It may not be as explicit, but it’s infinitely more powerful. That said, the confusion isn’t exactly unwarranted. Although it’s tough to remove our foreknowledge when returning to the episode, the episode’s clues are purposefully designed to obscure the truth until the final reveal. That fans would read so much into the episode makes it possible to build a puzzle episode like “My Screw Up,” but it requires safeguards so that viewers retain some doubt as the episode progresses. Speaking to his concern about viewers not being ahead of the twist, Goldman cites the puppet scene with Elliot as a key piece in the puzzle, one he pitched as a solution to this potential problem. In retrospect, it’s hard not to see through the scene’s misdirection: Although one could read the scene as Elliot reacting to Ben directly, she would react to nothing in much the same way. In rewatching, in addition to recognizing how much I enjoyed Fraser’s work in the episode, it was one of the scenes where I tried to place myself in an ignorant viewer’s shoes: Would I have started to doubt my suspicions? Would I have even had suspicions at all if I had watched this live as a high school student? Would this scene have instead just been a funny bit of physical comedy from Brendan Fraser? I have always admired the episode for its haunting final scenes, and that will always be its legacy. However, on revisiting the episode I was most struck with how typical the episode is up until those final moments. In the comments in previous weeks, as this review was anticipated, there was some discussion about how the episode’s B-story weighs it down. In hindsight, it’s hard not to see Carla and Turk’s argument over his mole as a silly diversion: the mole talks, the couple fights, and it’s all happening around something that we will later come to understand as deeply heartbreaking and meaningful. In the episode’s efforts to obscure its dramatic conclusion, the comic rhythms of the episode are fairly typical, and the quirky music cues and talking moles could be seen as a violation of the seriousness of the issues at hand. According to Goldman, the goal with the talking mole, at least, was a sense of balance: “it gave us some much needed levity, [necessary] even in a story where Cox is ostensibly mad at JD for losing his heart patient.” It was the same logic behind the shower shorts scene: Lawrence, who I also spoke with briefly about the episode, remembers the writers were all “giddy” about the idea, and included it to help meet what he calls a “weird burden to still make the show funny” that the writers felt with the episode. In addition to levity, though, the mole storyline offers an important counterpoint to Cox’s own experience following Ben’s death. Cox’s stubborn refusal to leave the hospital to face the truth is part of the episode’s tragedy, but it highlights the challenge of going on with your life in the wake of someone’s death. The mole storyline continues after Ben dies because our instinct after tragedy is to try to keep living as we were to maintain some sense of normalcy. For Cox it means living at the hospital and throwing himself into his work; for Turk and Carla it means continuing to fight a battle they were fighting before, albeit with the added weight of recent events. Carla’s line about it having been “an emotional couple of days” bridges the two storylines together, a clue that works to reframe their fight itself as a response to Ben’s death; although their lack of a strong personal connection to Ben makes their reaction to his death less intense, meaning they don’t immediately stop looking into having the mole removed, it changes the stakes enough for the two to reconcile the issue peacefully, and honestly. There is always the danger of critical reviews intellectualizing a show to the point where we become disconnected from our emotional responses; it’s rare that sitting in front of your television with a laptop registers as an emotional experience. However, as I reached the final scenes of “My Screw Up” I stopped taking notes. Part of this is that those final scenes are burned in my memory, “Where do you think we are?” becoming one of the most memorable lines in a series more often known for its one-liners. It’s also because I tear up every time I watch it. Despite the fact I can never recreate that initial realization, and despite the fact I intellectualized my way through the rest of the episode breaking down its structure and highlighting its tonal inconsistencies, I can’t help but break down as Ben asks Perry to forgive himself, or as we fade to black on Perry finally facing the truth he spent two thirds of the episode avoiding. It’s a bravado performance from John C. McGinley, equally as strong when Cox is hiding his grief as it is when all of that grief comes flooding over him. “My Screw Up” resonates so much with viewers because it was going for something. Structurally complex—Lawrence remembers obsessing with Goldman and Donovan about ensuring it would hold up to scrutiny, even over nine years later—and emotionally uncompromising, the episode stands as the pinnacle of the series’ commitment to the weight of death. Although this was only Brendan Fraser’s second appearance on the series, it was still the first time someone died who we didn’t first meet as a patient, and whose death exits the realm of the job description. It is inevitable when you work as a doctor that some of your patients will die, and Scrubs has on many occasions explored that reality of medical work. Although it is just as inevitable that we will lose someone close to us in our lifetime, we’re never fully prepared, especially if you feel you were in a position to do something about it (as Perry felt he was). The greatest clue that something is amiss is not the missing camera or the identical outfit, or the fact that Ben isn’t acknowledged by anyone but Perry; instead, the greatest clue is that Perry’s response—I can’t say enough about how important McGinley is to this episode—is very clearly that of a man who lost his friend, and not a doctor who lost his patient. The episode is neither the first nor the last time Scrubs would commit to the realism of its premise. It wasn’t even the last time Dr. Cox would blame himself for someone’s death and spiral into a deep depression as a result. However, “My Screw Up” comes at a time where—no matter my issues with J.D.’s character this season—the show was certain about what it was. After the initial growing pains, and before the show’s tone began to shift in later seasons, “My Screw Up” delivers its emotional gut punch with incredible confidence, perhaps standing as the pinnacle of the series’ storytelling. Credit for “My Screw Up” must also go to director Chris Koch—as much as this is an episode that depends on careful construction at the script stage and on the work of the performers, the director’s a key part in that translation. I particularly liked the staging of Ben suddenly appearing behind Dr. Cox as J.D. breaks the news about Ben’s death. I hadn’t realized that “Winter” was actually the first song Radin—a friend of Braff’s—had ever written, which Lawrence heard and felt was “perfect.” I’d agree, and it’s impressive it stands up here after Radin’s music has become so ubiquitous on TV. Goldman shares that one of his other concerns was that the episode would seem too coincidental with Ben happening to die while at Sacred Heart. I’ll admit I had the same thought rewatching the episode, but the payoff is so strong that it’s hard to hold it against the episode in any capacity. Lawrence shared that he continually gets people forwarding this Tintin comics panel to him and claiming that Scrubs plagiarized it; it’s actually a piece of fan art based on the show, but that apparently hasn’t stopped people from claiming otherwise. Special thanks to Neil Goldman and Bill Lawrence for taking the time to chat with me about the episode—I knew this one was a special one, and with no DVD commentary it felt like a space for some additional reflection. I chose to eschew stray observations on “My Porcelain God” given the weight of the second episode, so please do share thoughts/quotes/etc. in the comments, as per usual. Next time on Scrubs: A tormented mentor, and the butterfly effects of Sacred Heart.